Thanks Hana! I’m thinking of bringing leather flat boots as well, and waterproofing them. Not everywhere we’re planning on going actually gets snow, so I don’t want to rely only on one pair of boots. I love cardigans too, but this winter it’s been really hard to find them without stupid little pockets near the waist. Melbourne can have some pretty miserably cold weather when it blows straight in off the Southern Ocean, but we keep our snow on the mountains, where we can ski on it :-)Yvonne, that’s how I plan my wardrobe (OCD? who, me? ;-), or at least try and identify the gaps. I also do that when trying to decide what to make/buy next – see what gets the most hits, or what matches with orphan garments. I’d like to do the graph in at least 3D, so jackets/coats are on the third axis, but I end up just doing them separately.Actually, I mostly do it while sitting down the back of very long and boring meetings. Writing a series of lists doesn’t get as much attention as doodling, and I can’t get away with knitting, even though I don’t knit with my ears. Yes, love the Wardrobe Grid, Yvonne! That kind of obsessiveness is right up may alley.I must stress, however, that it is not enough to just eyeball your clothes to match them. I do a kind of paperless wardrobe gridlay everything I’m considering taking out on my bed and shuffle it all around to see what goes with what. But before I make my final decisions, I always try each outfit on. Because quite often two garments that seem to go together perfectly when laid out flat next to each other look like a dog’s breakfast when combined on my person, or with the shoes I’m planning to bring. You don’t want to find that kind of thing out when you’re a thousand miles from your closet. A pre-packed toiletry kit is *especially* useful if you don’t travel often. I keep mine always ready to go, and this way it’s easy to remember what to bring and where it all is. (I’m not a list person – having all my stuff physically in one bag is like a 3-d list I won’t lose!) My top tips not mentioned here: * Be ready in case of lost luggage: your toiletries, a change of clothes, and anything you can’t live without should be in your carry-on. * bringing 2-3 days worth of clothes (all stylistically compatible with each other) is a good compromise between the nightly laundry approach and the large suitcase approach. * Bring a laundry bag, even if it’s just a pillowcase or plastic grocery bag. It separates your clean from dirty clothes, and makes laundry easier when you get home (just dump the bag into your hamper). 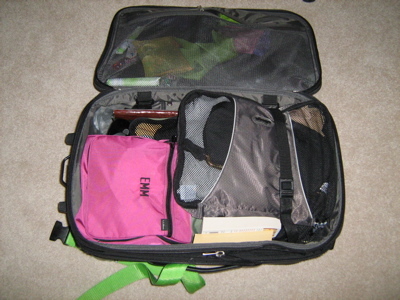 Great tips – I travel a lot for my job too, and have ready packed toiletries for 1 week, 2 week and 3 week trips. I’ve just come back from Mumbai, and would add another essential to the packing list – a bin liner! The rain was so torrential, and luggage left outside, that by packing my clothes inside a binliner in my suitcase meant that they stayed reasonably dry! Awesome tips, from Erin and everyone. Whenever I’m traveling to a city, or somewhere where I might want to dress up a little for dinner, I pack two or three silk chiffon blouses. They roll or fold up to nothing, and any wrinkles pretty much shake out once you hang them. Also, if you’re limiting yourself to a neutral color scheme, with chiffon you can throw in a few crazy colors or patterns to mix it up a little bit, without using up too much packing space. Just remember to pack a camisole to offset the sheerness factor. I always bring a few silk scarves too — sometimes that little pop of color makes you feel as if you’re -not- living out of a suitcase. Cheers! Wow, Erin, those are great tips for just staying in one place, never mind travel! How have I lived this long without hearing of BodyGlide? The knowledge that it exists has transported me, like a religious experience or something. lanne,You are on the right track, black, black, black and tights. You will look chic, you will not look like a tourist. The perfect travel coat would be a black mohair (if you are a sewer you can make your own). Mohair is light and super warm. I’d also take a raincoat, I have a large crinkled shell that fits over the coat. I’ve had this raincoat for 20 years (Babette). If you are in Venice in winter it can rain where you need to walk around in boots (waterproof). i don’t doing laundry on long trips. We went to Italy for our honeymoon and knew we should pack light because no elevators, cobble streets and lots of walking with a 50lb bag is NO fun.We just hung things to dry in our hotel and were fine. Why A-line skirts with pockets for the airport? Does it have to be a skirt & top, or does an A-line dress with pockets work? Pockets I can guess why, but what about an A-line skirt makes it ideal? Minya, I like A-lines because they’re easier to move in than pencil skirts and aren’t as bulky as circle skirts … and if I spill something down my front (which has happened) I can usually swap out a new t-shirt from my luggage quickly (not the case with a dress).